After announcing that it would be dropping the free storage limit offered to OneDrive users from 15GB down to 5GB, and announced the end of unlimited storage for Office 365 users last month. 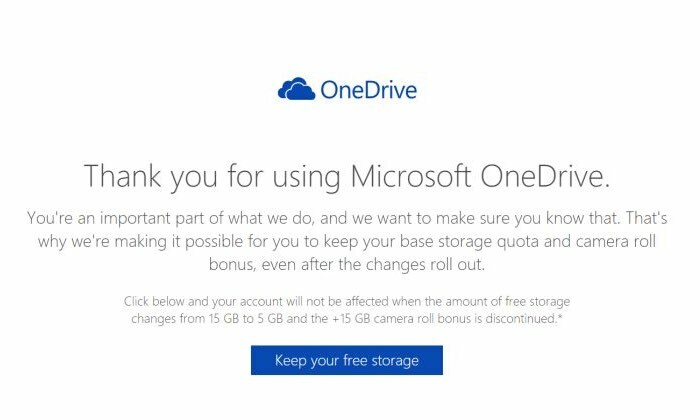 Microsoft has tried to bring a smile back to OneDrive users by offering the ability for users to keep the original free 15 GB of storage they were allocated. During the announcement Microsoft explained that starting early next year anyone who signs up for Microsoft’s cloud storage will only receive 5GB of free storage, instead of the 15GB that is currently on offer. However if you already have 15GB of storage jump over to the OneDrive site via the link below and click the “keep your free storage” button to grab your 15GB of free storage before the changeover date. Also if you use the OneDrive application with the camera roll feature enabled You will also be able to keep the extra 15GB bonus which is provided by Microsoft allowing you to use up to 30 GB of free cloud storage from the service. For more information on the new OneDrive changes to the free storage jump over to the official Microsoft OneDrive website for details.